You can't escape the festivities for the Queen's Diamond Jubilee in the UK at the moment! 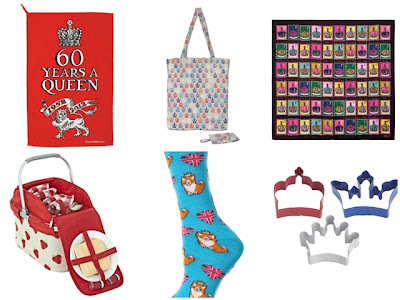 Shops have been filling with Jubilee inspired gifts over the past few months and this last week I've seen quite a few questionable Jubilee fashions, think Geri Halliwell in that infamous union jack dress! If you're not looking to rock your inner spice girl (!) here's a selection of some of my favourite Jubilee items to help you get in the spirit and join the celebrations this weekend. I love the little crown cookie cutters, they're great for making some jubilee themed biscuits if you're going to a street party or having a party of your own. If you're looking to treat yourself, how about one of the specially designed Jubilee print scarves from Liberty? I also love the cute Corgi patterned socks from Topshop! What have you got planned for the Jubilee Weekend? Have you bought any memorabilia? Ooh all of these are such great ideas! 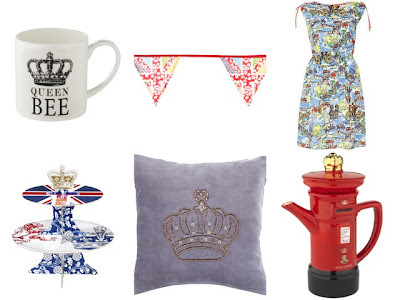 I particularly like the crown cushion from john lewis! I was scrolling through the Next website the other day and came across the range of Union Jack dresses Geri had designed for them, definitely made me giggle! I love that strawberry picnic hamper, so cute! Oooh I love the teapot! I am so in love with all things English! One of my favorite countries ever, I am so jealous of all of you who get to experience this first hand. Have fun!! oooh they're so cute! I totally love that tea towel and the corgi socks! hee hee so adorable!